Why is a regulatory strategy necessary? There are a lot of questions on how to successfully launch new therapeutic products on the global market. Developing the best regulatory strategy is absolutely critical to expediting regulatory approval, off-setting any imminent risks (i.e. from competitors) and avoiding pitfalls from changing regulations during the product development lifecycle. 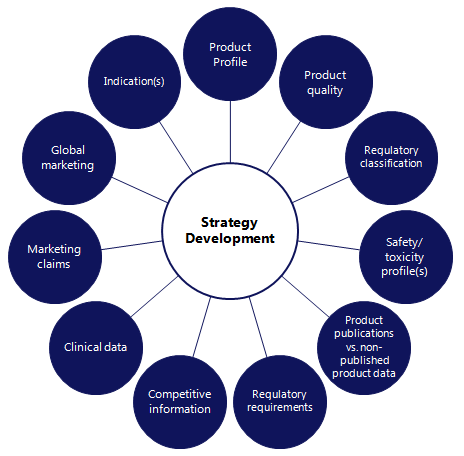 It’s easy to see how regulatory strategy encompasses a wide range of activities and disciplines. Having regulatory & clinical experts involved in the process from the beginning ensures a strategy is in place which aligns both marketing & regulatory activities. AXSource consultants will provide you with a documented regulatory strategy which defines a path for expeditious approval (including any contingencies), aligns with regulatory agencies, and can be easily communicated to all stakeholders. Without a strategically planned approach, it becomes near impossible to mitigate risk. In such cases, companies will likely experience unforeseen risks, issues causing unexpected delays, increased costs, a waste of resources and missed requirements. Let AXSource develop the best regulatory strategy for you, so that you are first to market your products!